Instant pot mung beans curry using dry whole green mung beans, tomatoes and spices is very delicious, quick and super easy to make with very minimal efforts. This is also known as cherupayar curry, pachai payaru curry etc in South India which is often served with rice or other dishes. Learning the cooking time for mung beans using instant pot helps you to make a lot of instant pot mung beans recipes like instant pot mung bean soup, stew, curry etc. 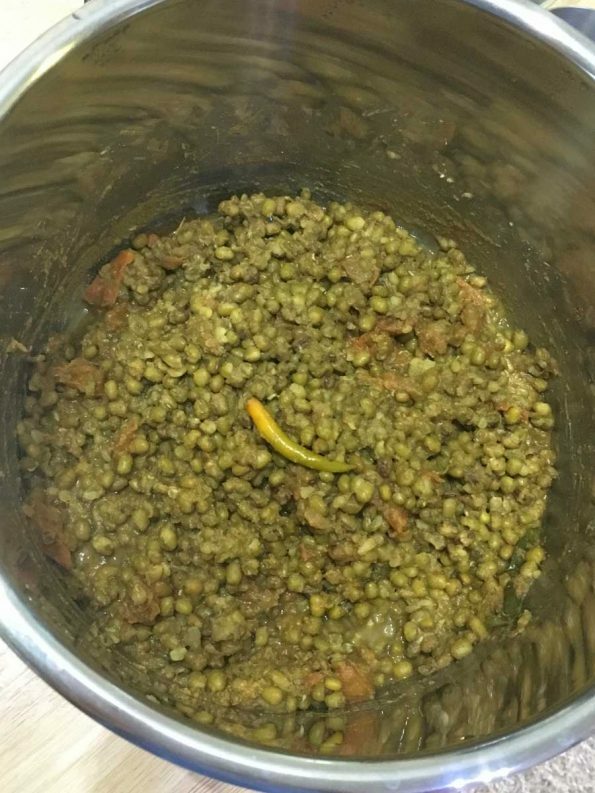 We can cook dry green mung beans directly in the instant pot as the green mung beans do not need prior soaking. 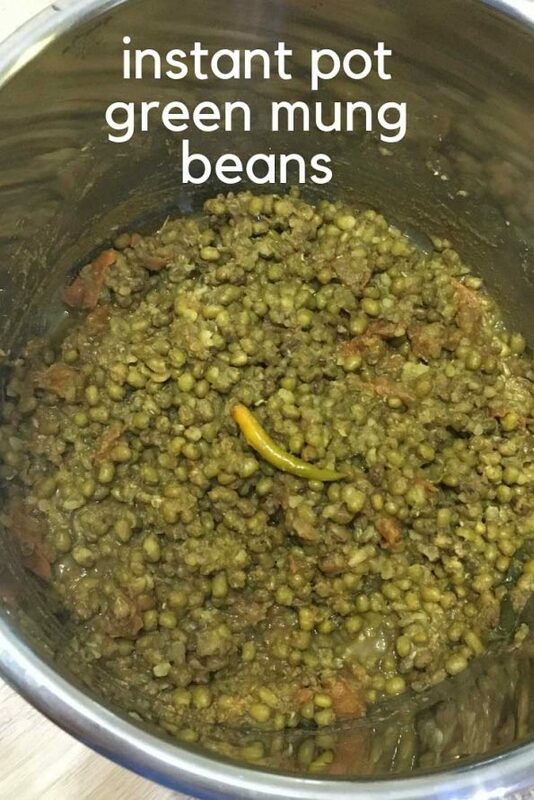 We use whole green mung beans to make this delicious curry which goes great with rice or Indian dishes like chapathi, poori etc. 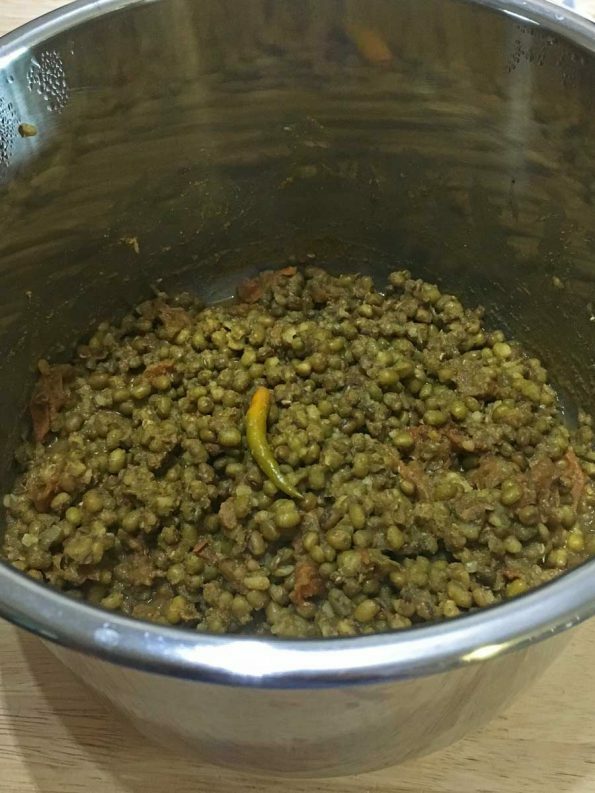 (the cooking time for yellow split mung beans instant pot may vary, as I make something using the yellow mung beans, which is the skin removed version of green mung beans, I will add it to the blog). You can easily prepare this green mung bean curry using a 6 quart instant pot as I did. As I mentioned above, as you learn the cooking time and water ratio for cooking green mung beans using instant pot, you can also learn to make green mung bean soup, stew etc using instant pot. Once you have finished the cooking, you can serve this as it is or if you prefer more gravy, you can add more water and stir well which will easily blend with the cooked green mung beans in the instant pot. If you do not have instant pot also, you can make delicious green mung bean curry using a pressure cooker following this green mung bean curry pressure cooker recipe. 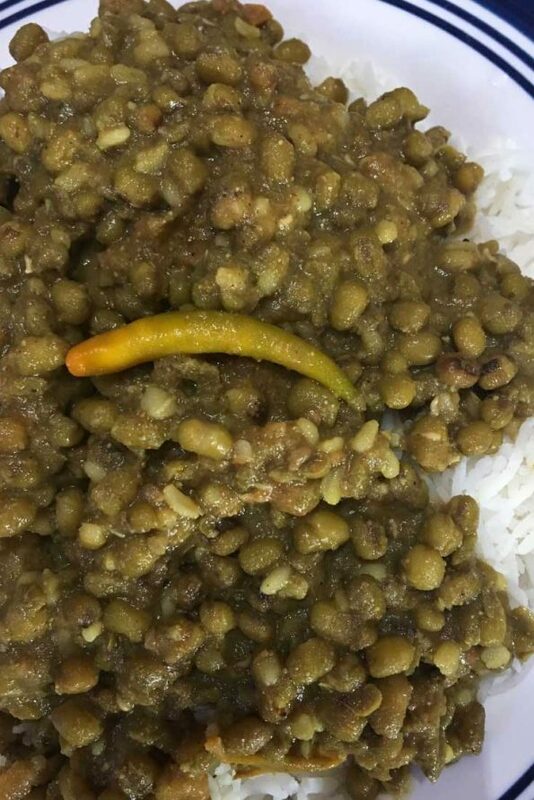 Green mung bean curry is made using green mung beans which is very popularly used in South India, where its also known by the names cherupayar, pachai payar etc and it is also known as green moong dal in India, which is very healthy as well as delicious when used in dishes like curry, stews etc. Green mung bean curry is simple and easy to make and it is healthy and delicious which can be served with rice for a simple and easy vegetarian lunch or dinner. In this instant pot mung beans curry, we uses green mung beans, tomatoes and spices. I didn’t use any onions as I wanted to make it very quickly and I didn’t want to chop the onions or saute it. If you wish, you can also chop half of a large onions (or use a whole medium sized onion) and saute it in the instant pot using little oil and the saute option for about 2 to 3 minutes, then press the ‘keep warm’ button and follow the rest of the instructions as mentioned in the recipe, so you can have sauteed onions also in this green mung beans curry. However, even without adding onions, this instant pot green mung bean curry is very delicious as we use tomatoes and spices to prepare the gravy. So you really do not have to use onions if you want to make this quickly, you can just go ahead and make it fast following the directions in the recipe! I used coconut oil in this instant pot mung bean curry, but you may also replace the coconut oil with butter, ghee or any of your favorite oils as you wish. See here how to cook chickpeas in instant pot(garbanzo beans recipe). You can see all instant pot recipes in this blog here. So here is how you can make this quick, easy and delicious green mung bean curry in instant pot following this easy instant pot mung beans curry recipe. Instant pot mung beans are easy to cook and you can follow the recipe to make instant pot mung bean curry (with green mung beans) and also learn to cook green mung beans in instant pot for soups, stews etc. 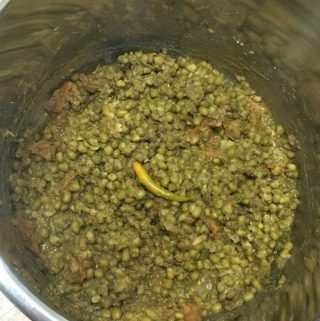 Wash the green mung beans and add it to the inner pot of instant pot. Wash and chop the tomatoes to small pieces, add the chopped tomatoes also to the pot. Add the green chilies, ginger garlic paste and also enough salt, mix everything well. Now add all the spices to the pot - turmeric powder, red chili powder, coriander powder, garam masala powder and cumin seeds powder, mix the contents well. Finally add the 3 cups of water to the pot and also add the coconut oil, stir well and close the instant pot with lid in sealing position. Press manual and pressure cook in high for 5 minutes of time. The instant pot will take a few minutes until the pressure is built up inside, and until then it will show 'On'. Once the instant pot starts cooking, it will show the minutes that you have set for cooking and will beep once its done cooking. Once the cooking is done and instant pot beeps, press 'keep warm' and wait for natural pressure release which will take another few more minutes. Once the pressure is all naturally released, carefully turn the lid to venting position and open the lid, see if the mung beans is all cooked and soft. 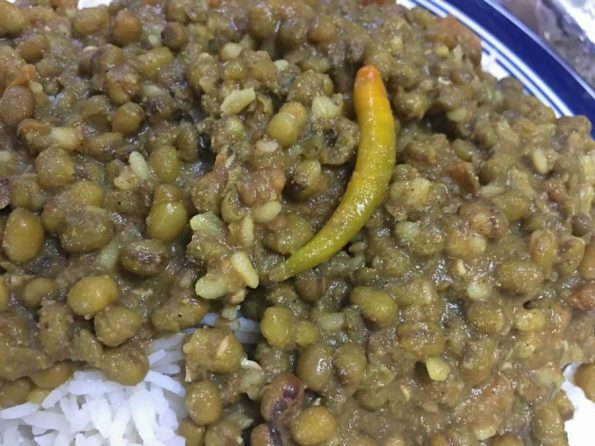 You can enjoy the green mung bean masala as it is delicious or you can add the remaining extra one cup of water and stir well which will make enough gravy for the green mung bean curry. Stir well and the green mung bean curry is ready to be served! Enjoy the delicious instant pot mung beans curry with rice or chapathi for lunch or dinner as you wish. 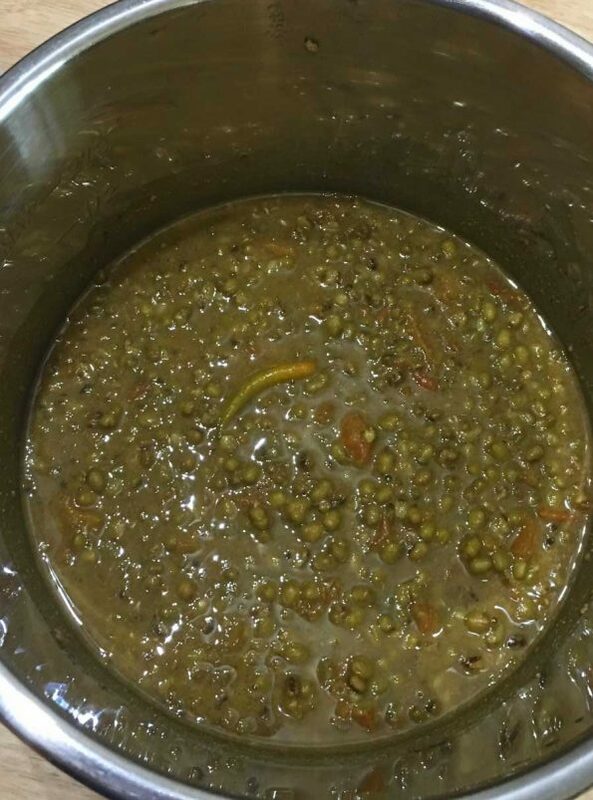 Hope you found this post on instant pot green mung beans curry helpful in making easy, quick and delicious green mung beans curry using instant pot.